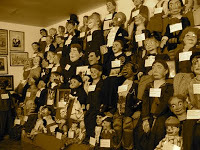 Avi Steinberg on dummies and why we are fascinated by them @ the Paris Review. I’m waiting for the elevator in a medieval-themed hotel in Fort Mitchell, Kentucky, when the elevator doors open to reveal a heated exchange between a bald man in a Hawaiian shirt and a puppet shaped like a toucan. My presence brings an uncomfortable end to their private imbroglio. Both stare at me silently as I enter the elevator, and for five awkward floors I’m brought into direct contact with what George Bernard Shaw described as the “unvarying intensity of facial expression” of puppets, an attribute he believed makes them more compelling actors than humans as they call themselves, gather from all over the world. For four days, they attend lectures on the business, getting advice on AV equipment, scriptwriting, or creating an audience through social networking. They listen to a keynote address by Comedy Central’s ventriloquist-in-residence, Jeff Dunham, who exhorts his notoriously defensive colleagues to “quit complaining that people say we’re weird. We talk to dolls. We are weird, ok. Just own it.” They eat at a Denny’s off the highway and visit the creationist museum down the road. And they don’t go anywhere without the accompaniment of their alter egos.